Twenty years after the end of apartheid, a new generation is building a multiracial democracy in South Africa but remains mired in economic inequality and political conflict. The death of Nelson Mandela in 2013 arrived just short of the twentieth anniversary of South Africa’s first free election, reminding the world of the promise he represented as the nation’s first Black president. Despite significant progress since the early days of this new democracy, frustration is growing as inequalities that once divided the races now grow within them as well. 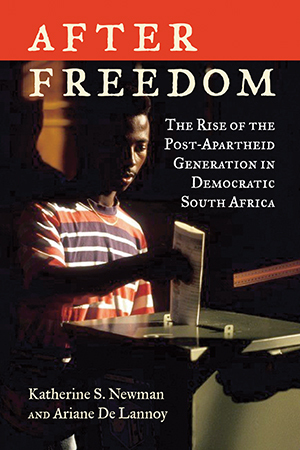 In After Freedom, award-winning sociologist Katherine S. Newman and South African expert Ariane De Lannoy bring alive the voices of the “freedom generation,” who came of age after the end of apartheid. Through the stories of seven ordinary individuals who will inherit the richest, and yet most unequal, country in Africa, Newman and De Lannoy explore how young South Africans, whether Black, White, mixed race, or immigrant, confront the lingering consequences of racial oppression. These intimate portraits illuminate the erosion of old loyalties, the eruption of class divides, and the heated debate over policies designed to redress the evils of apartheid. Even so, the freedom generation remains committed to a united South Africa and is struggling to find its way toward that vision.